« Where Did The Time Go? It has been over a week since I wrote last, seems as if so much has been going on that I haven’t been able to figure out what day it is at any given time. However, it has been quite interesting and some accomplishments. Last Sunday Eddie was MOD at the Future of Flight, he invited me to come with him – of course, I said yes. I checked with charlotte to see if she was available in the afternoon and she was. Decided to go to Pacific Fabrics in Everett, there is an IHOP across the way. Not my favorite place, but I was mostly interested in seeing Char. Eddie didn’t have to be there until about noon, that meant we could sleep a bit later, have a leisurely breakfast and take our time. Last weekend was really hot – for us – and being outside wasn’t all that comfortable. We had fun at lunch laughing and talking, bringing up old memories – we have a lot of them because we have been friends since 9th grade. She has been checking out my remodel blog plus making comments. We have decided it is her turn to come down this way again and she will be able to see the kitchen and the new bathroom. They were great at IHOP, we asked for a quiet table and she had one in the back. I asked if she would not bring kids back there – my friend is a kid person but I’m not. She laughed and there were no kids while we were there. When we came out of the restaurant it was hot, unfortunately no parking spots in the shade. So we did the next best thing – had the rear of the car facing the sun. Still hot when we got in, but there was no solution for that but to run the air conditioner. The last time I had been to Pacific Fabrics, I had seen a folded square that intrigued me. I showed it to Char to see if she had done it,but she hadn’t. They had instructions for a 4″ square and I decided to buy it and some fabric to make it. 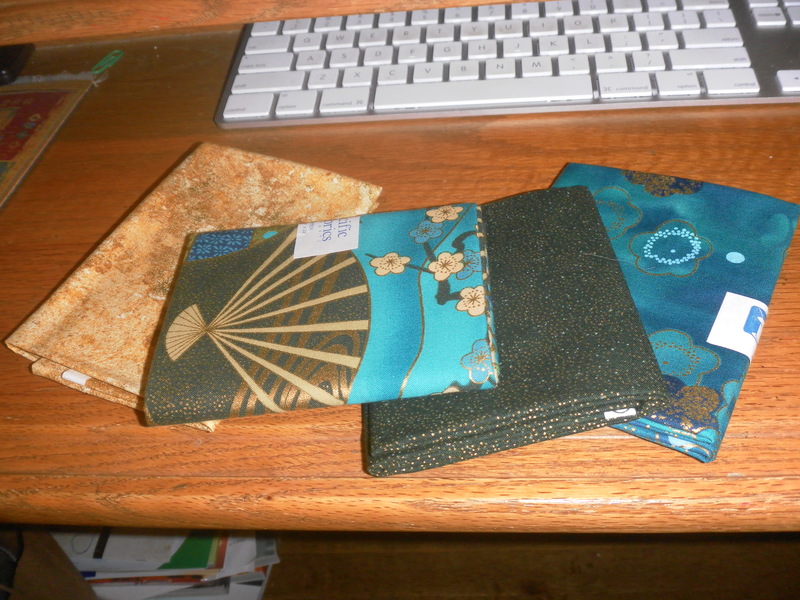 Definitely needed her help – I can get the first three but it is the last fabric that frustrates me. She found the last one and now I have to have one made the next time we meet. I have been looking at the pattern all week trying to figure out how it works – not much in the way of illustration, mostly text. I think I have figured out the first row, but it took several days before it finally hit me how to the make second row on the diagonals. I think I have the idea but the way I would do it isn’t according to the instructions. I am going to just have to actually make one and see how it works. We always have fun in the fabric stores and Char seems to know everyone. She is very friendly and rather a motormouth like me, so we have such fun together. She found some fabric as well, so we both did quite well. I usually help her spend her money, this time she also helped me spend some of mine. 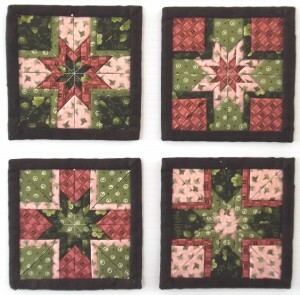 I haven’t been quilting in a long time since I burnt myself out a few years ago. I am beginning to be interested again, though not sure when I will have the time. I have a big problem in the fabric store, I see fabric I want to buy but not anything to use it for at that moment. I promised myself I wouldn’t build up a stash – I have but sometimes I see fabric and I just WANT it. I slept poorly Sunday night and Monday morning I had a chiropractor appointment and a massage. Oh how good those felt. I found myself a bit depressed Monday and was able to release what was bothering me during my massage. Brad spent the first three days of the week working, then he had a family holiday over the 4th and will begin a new project Monday. He still has some work left here and when he knows what’s happening with the new project, he will come back. I told him to come anytime since he has a key. Monday was probably the hottest day of the week, Brad put up the kitchen blind and it made a big difference. Although we didn’t have the back screen door on for a breeze, we opened all the windows on the other side of the house and we did rather well. I slept so well that night and Tuesday I was feeling so much better. Hmm, this is getting a bit long for my posts, looks as if I will have to do a Part 2. Either that or write more often. This entry was posted on July 7, 2013 at 11:52 am and is filed under Musings. You can follow any responses to this entry through the RSS 2.0 feed. You can leave a response, or trackback from your own site.